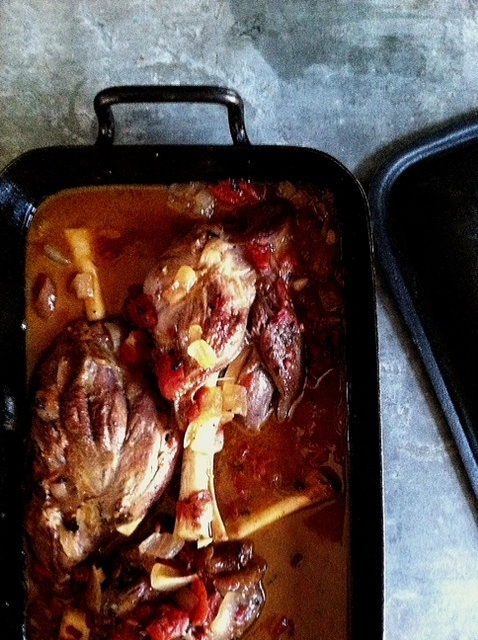 Here is a recipe for you lamb lovers. 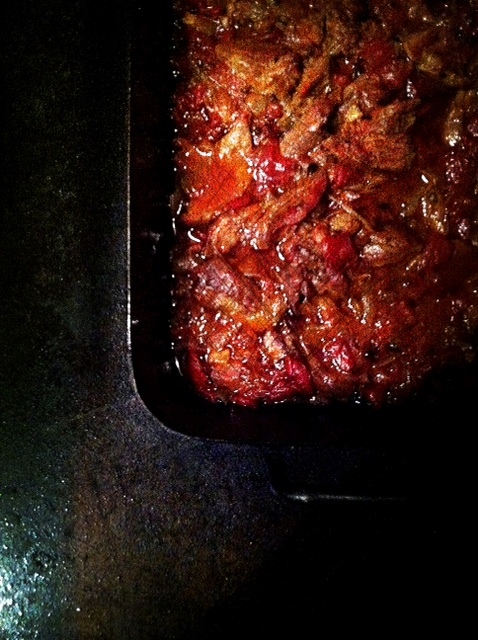 While waiting for summer to arrive so you can set your grill for burgers and kabobs, you can braise in the oven. This is a very simple recipe, it can be made ahead of time, in fact it is best to make it in the morning or the day before as the flavors intensify as the dish sits. The cinnamon stick might sound weird but is a must. Served on a bed or rice or roasted potatoes, green beans and chunks of crusty bread it makes the perfect meal for those cool spring nights. 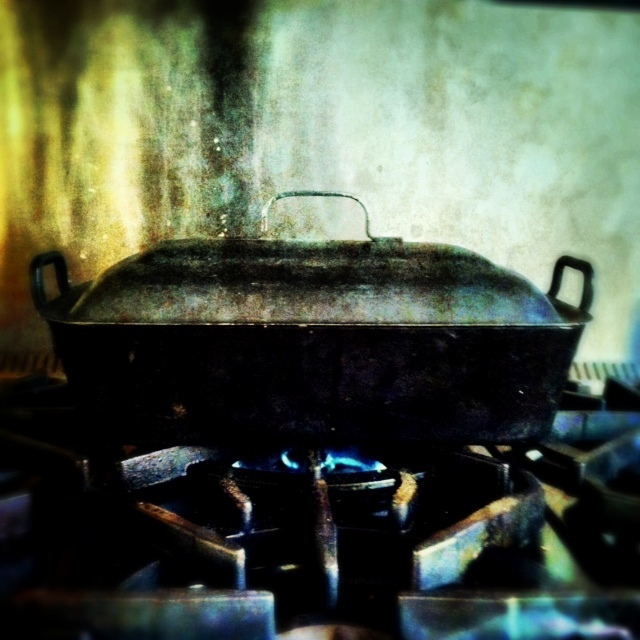 Heat the oil in a large dutch oven or in an oven proof pan. Salt and pepper the shanks and sautée in the pan until nicely browned on all sides (about 3 minutes per sides). Remove from the pan and set aside. Melt the butter in the pan, add the onions and cook until soft (about 5 minutes). Add the garlic and stir for 1 minute. 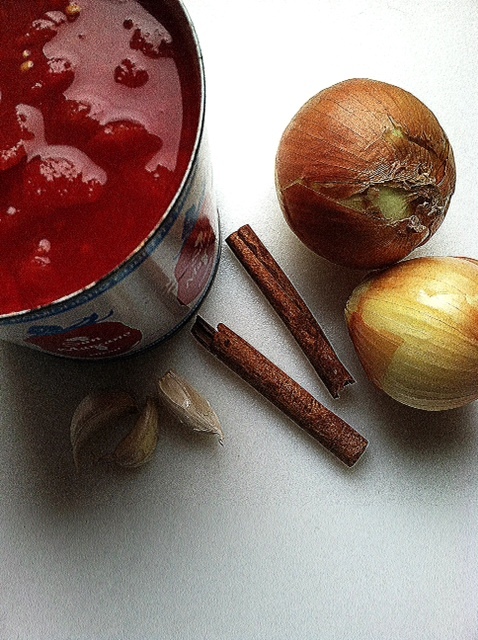 Add the tomato, beef stock and cinnamon. Stir and bring to a simmer. Add the meat, return to a simmer, cover and put in the oven. Cook for 2 hours. After 2 hours, take out of the oven. 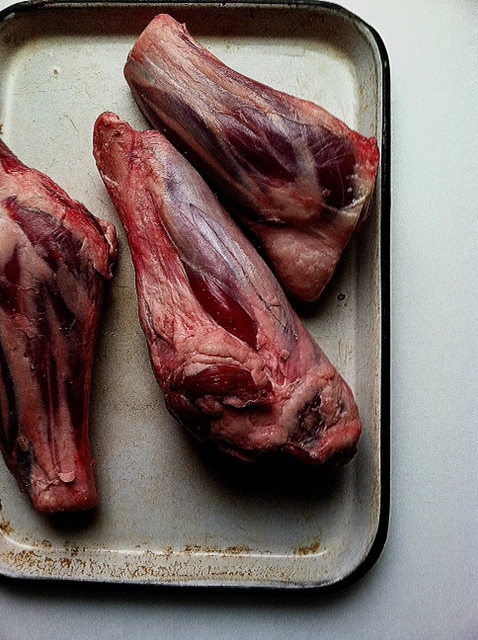 The meat should be soft and coming off the bone. Let the dish cool down a bit and remove all the meat from the bones. Discard the bones and return the meat to the pot, stirring into the sauce. Remove the cinnamon stick and cook for another 45 minutes at 350 degrees. We have all made our share of brownies. In fact, it was the first dessert I ever baked. I was too afraid to make a cake and deal with frosting, and preferred being rewarded by a chocolate success that everybody is more then happy to devour. 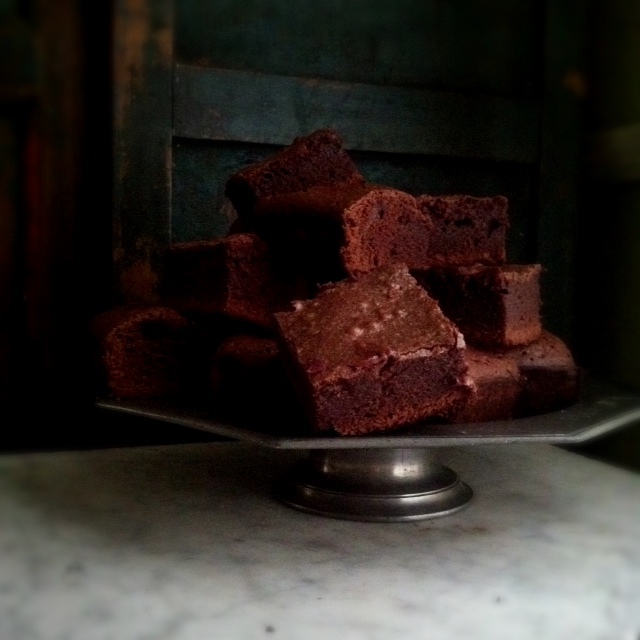 Some people like their brownies “cakey” others “gooey” – I like mine à la Nigella. When I got her book How to Be a Domestic Goddess back in 2001 I discovered her brownie recipe and have been using it ever since. 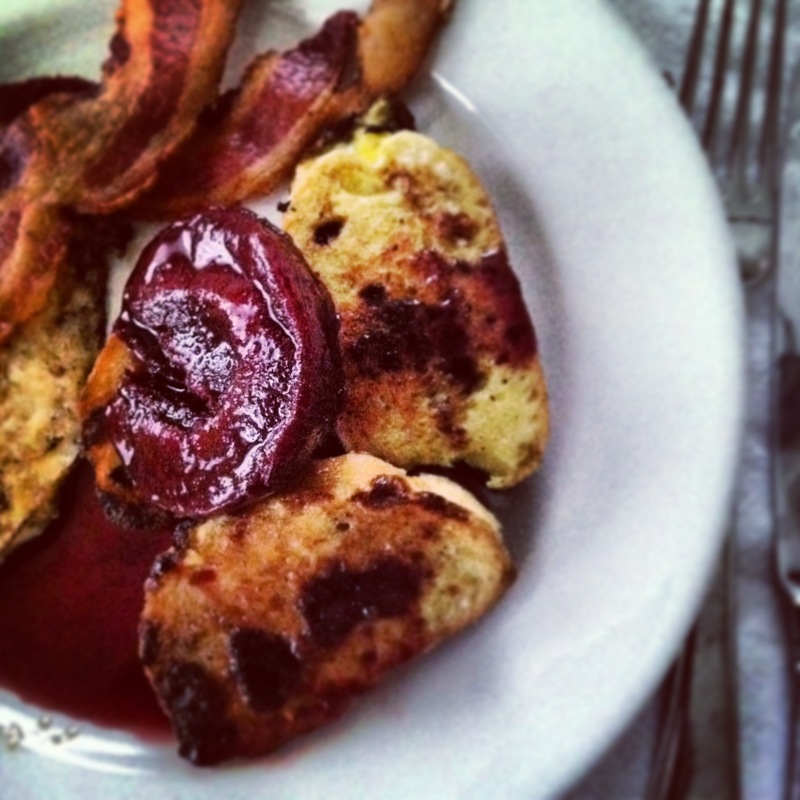 Everybody I have served them to exclaims how wonderful “my” recipe is and all I can say is Oh! Thank you Nigella for turning me into a domestic goddess! 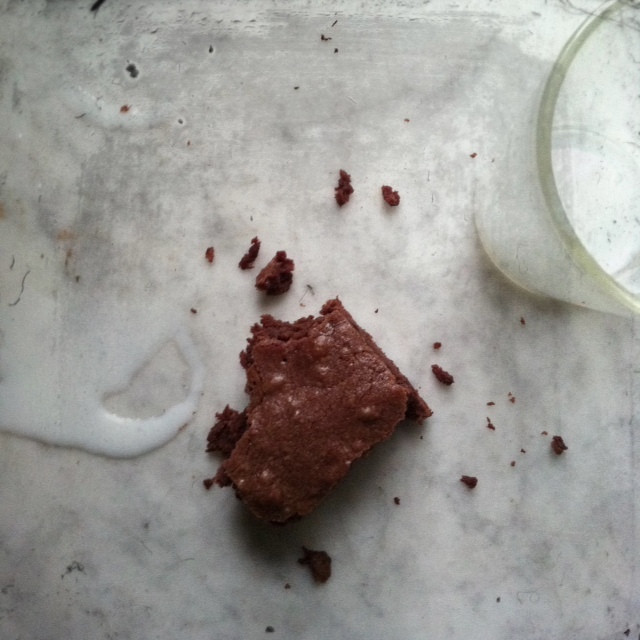 Try it and judge for yourself, I’m sure you too will make it your brownie recipe. Preheat the oven to 350 degrees. 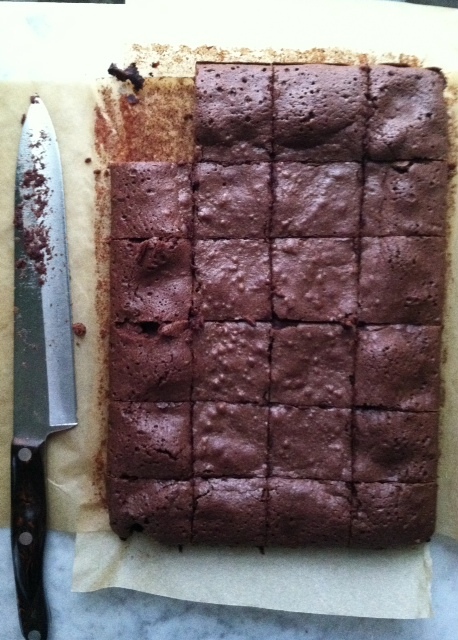 Line a brownie pan (13 x 9 x 2.5 inches) with parchment paper. Melt the butter and chocolate in a double boiler, set aside and let cool. 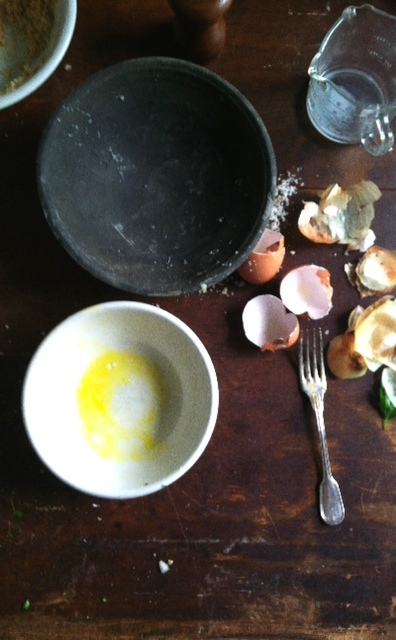 In a bowl, beat the eggs with the vanilla and sugar. Measure the flour into another bowl and add the salt. 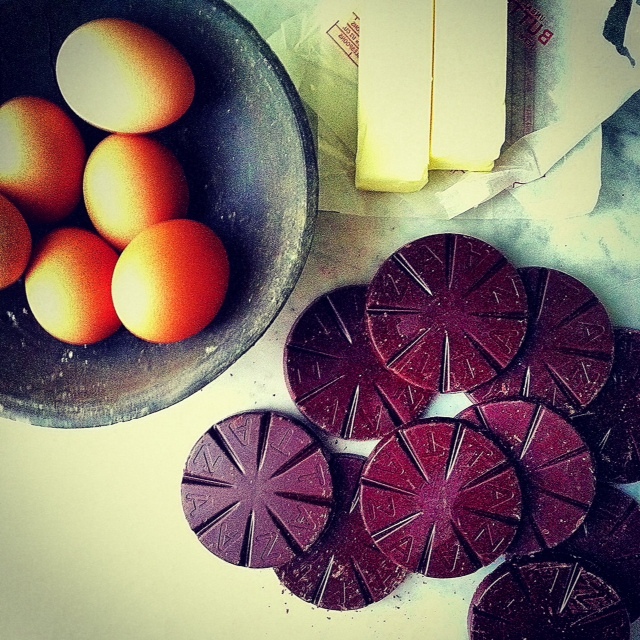 Transfer the cooled chocolate into a bowl. 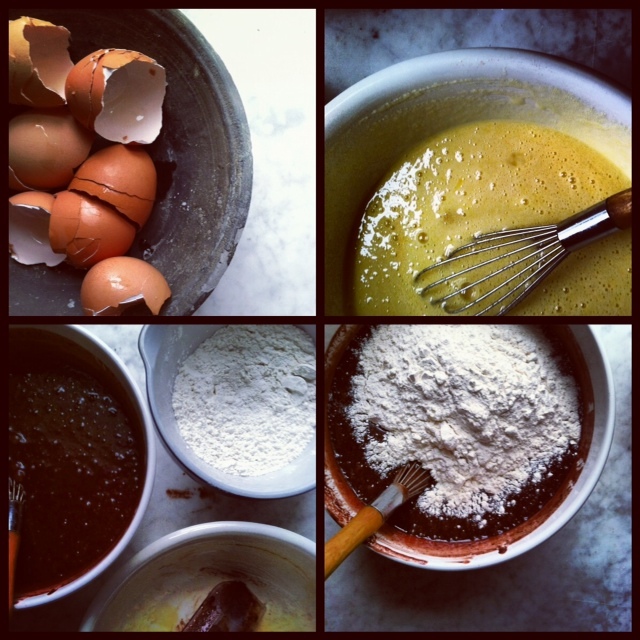 Beat in the eggs/sugar mixture and then the flour. Beat to combine smoothly and then scrape into the lined pan. Bake for about 25 minutes. When it’s ready, the top should be dried to a paler brown speckle, but the middle still dark, dense and gooey. And even with such a big batch you do need to keep alert, keep checking: the difference between gungy brownies and dry brownies is only a few minutes; remember that they will continue to cook as they cool. NOTE: I like my brownies plain but you can add 1 1/3 cup of walnuts or other nuts, white chocolate chips, dried cranberries or shredded coconut. 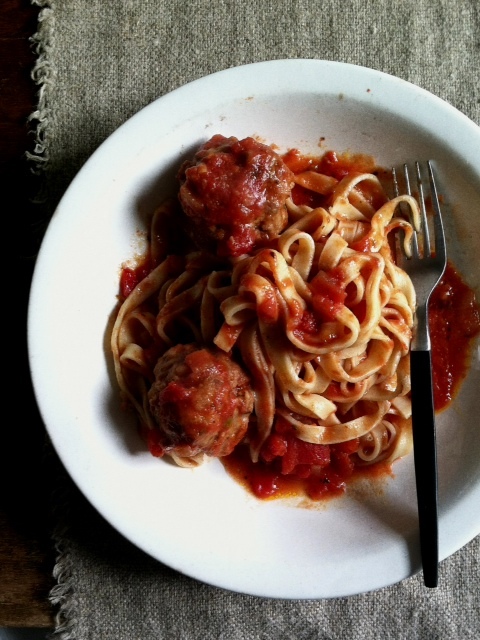 When one thinks of Italian food, spaghetti and meatballs comes to mind. It’s a great go-to recipe when you have a crowd or a pot luck dinner. It can be made in advance, it’s easy to reheat, and everybody loves it from the youngest to the oldest member in the family. If you are vegetarian or want a lighter meal you can skip the meatballs and only have the sauce. It is simple, fast and I tend to make a big batch so I can freeze it or reheat it later in the week. 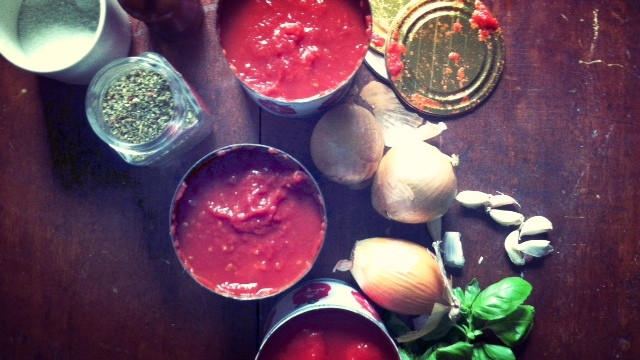 Make sure you use San Marzano tomatoes as the taste will make all the difference! Heat 3 tablespoons olive oil in a large stockpot or dutch oven. Add onions and sautée until soft, about 5 minutes. Add the garlic, stir and cook until fragrant, about 1 minute. Add the tomatoes, stir and add the wine and seasonings. 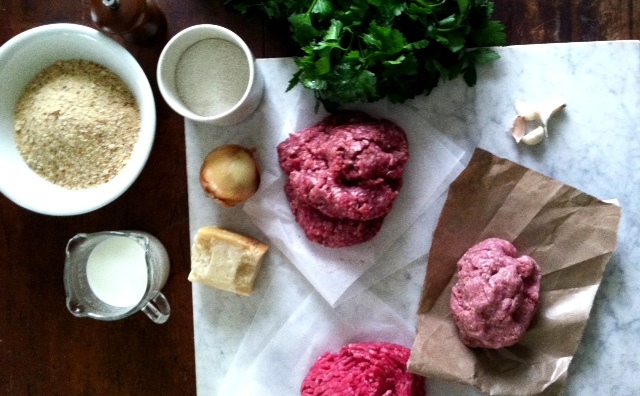 Bring to a boil, reduce the heat to a simmer and cook for 45 minutes if you opt not to make meatballs. If you do, simmer the sauce while making the meatballs and don’t worry about timing. In a small bowl mix the breadcrumbs and milk and let sit for 10 minutes while mincing onion, garlic and parsley. In a large bowl mix meats, breadcrumb/milk mixture, onion, garlic, parsley, parmesan and egg making sure all the ingredients are evenly distributed without over mixing. Season with salt and pepper. Put the flour in a shallow plate. 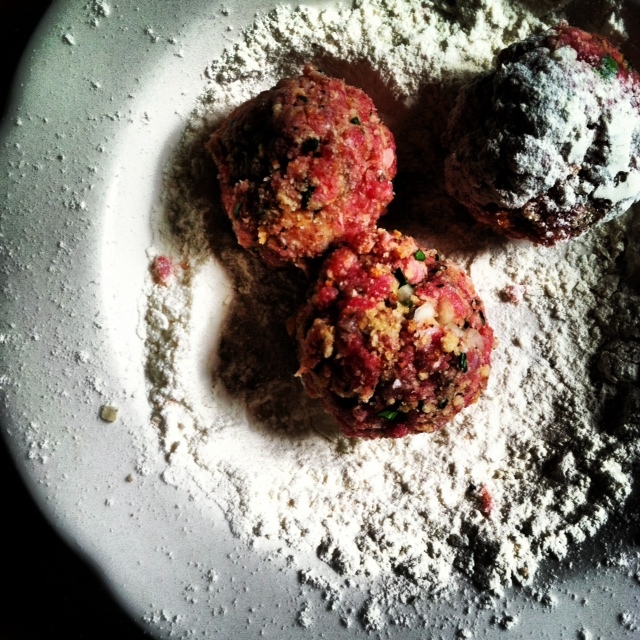 Shape the meat mixture into 2 inches round balls. 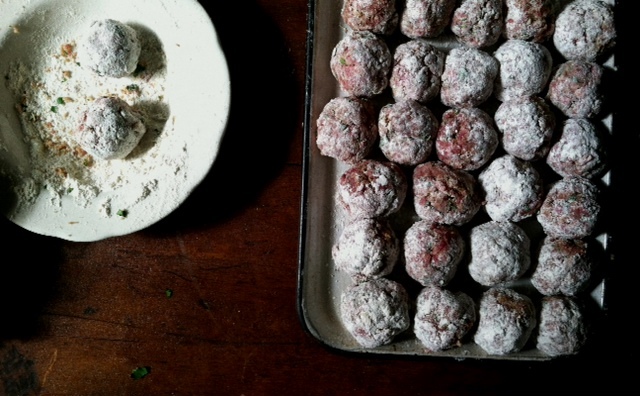 Roll each balls in the flour to get them covered slightly and place in a baking dish. 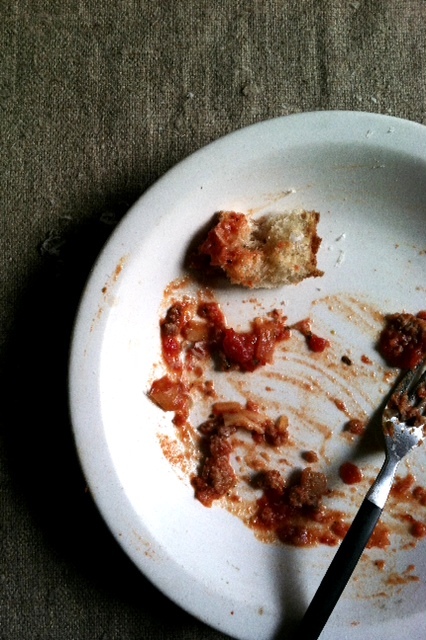 You should roughly end up with 30 meatballs. 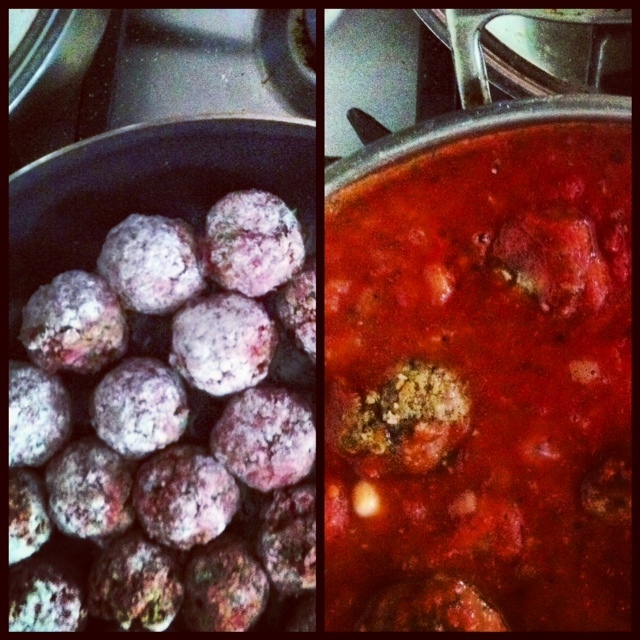 When done, heat 2 to 3 tablespoons of olive oil in a large saucepan and brown the meatballs. Depending on the size of your pan you might have to do this in 2 to 3 batches. You don’t want to cook the meatballs, only browned them. As they get ready slowly put them in the simmering sauce. When all done, continue to simmer for another 30 to 45 minutes to finish cooking the meatballs. Right before serving you can chop 1/4 cup of fresh basil and stir into the sauce. Serve with fresh pasta: thick spaghetti, bucatin or fettuccine and lots of grated parmesan, nice crusty bread and a bottle of red wine. NOTE: as this recipe makes a lot, you can freeze some of the leftovers for later or crush the meatballs in the sauce and use it as a base for a meat lasagna. Two weeks ago while visiting my daughter in Montreal we both decided to have a “family” dinner with her roommates and a few friends. One of my favorite things to do while away from home is going in farmer’s markets and grocery stores. I get inspired by what is available and current in the city or region I am visiting. While going down the aisles we came up with a menu: crabmeat stuffed fillet of sole, pears wrapped in prosciutto, haricots verts… As we were leaving the produce section I spotted our dessert! Beautiful plums on sale! They are not in season but a trip to the liquor store will take care of making a tasty dessert. 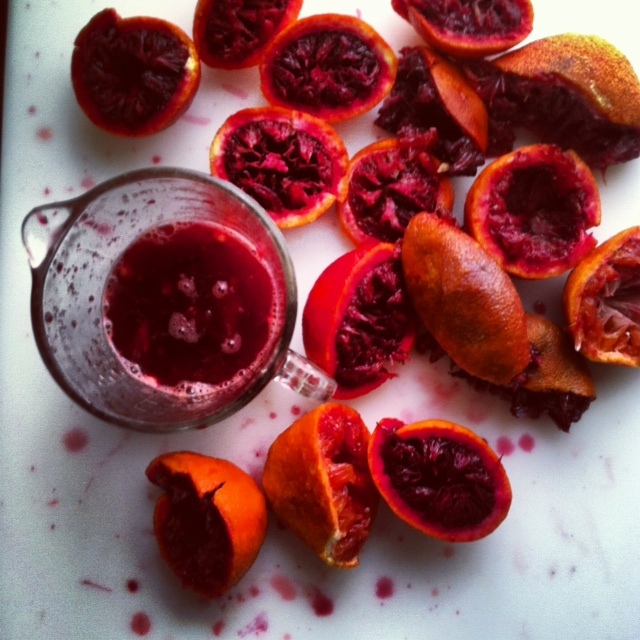 Wash and cut the plums in half. With the help of a small spoon, remove the pit. Set aside. In a medium saucepan, bring the wine, sugar and spices to a boil. Give the syrup a stir to make sure the sugar has dissolved. 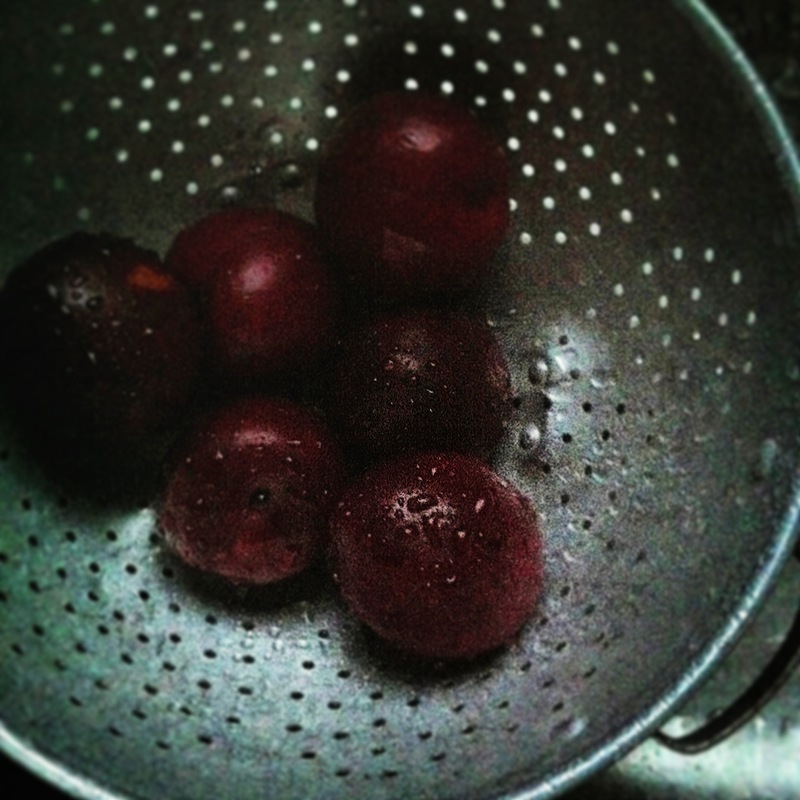 Put the plums in the pan making sure they all get covered with the liquid. Bring the temperature down to a simmer and cook for 15 to 20 minutes uncovered. The plums are ready when they feel soft when pierce with a knife. Set aside at room temperature until ready to serve. Serve with ice cream , whipped cream or on their own for dessert. They are also great with yogurt or on french toast, waffles and pancakes for breakfast. NOTE: The cooking time will depend on how ripe the plums you purchased are. 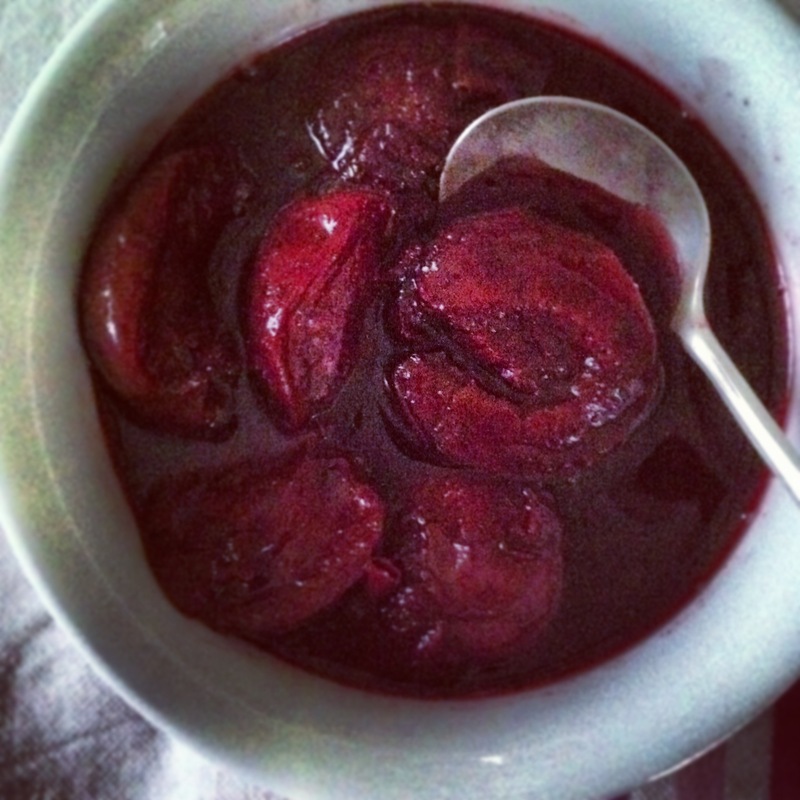 Make sure not to overcook them as you will end up with mushy broken plums. 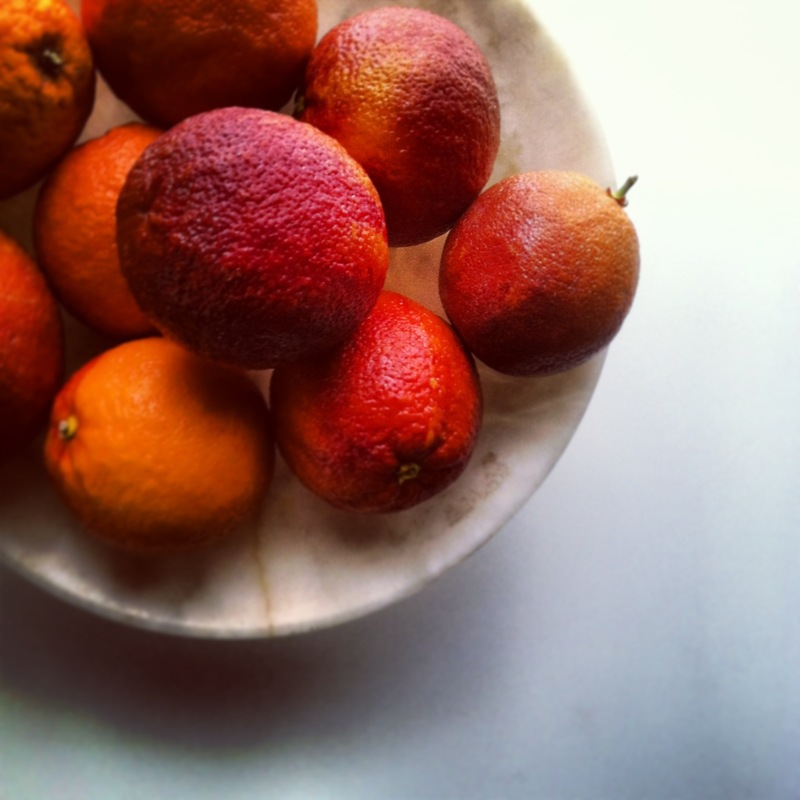 Blood oranges are in season and since it is a short one, I can’t resist buying them. They are wonderful eaten as is, in fruit salads or on a bed of greens. They are not as acidic as regular oranges and their sweet juice makes wonderful cocktails. I love them as a soda : Orangina Rouge and the Sanpellegrino Aranciata Rossa being two of my favorites. Trying them as a sherbet was even better! 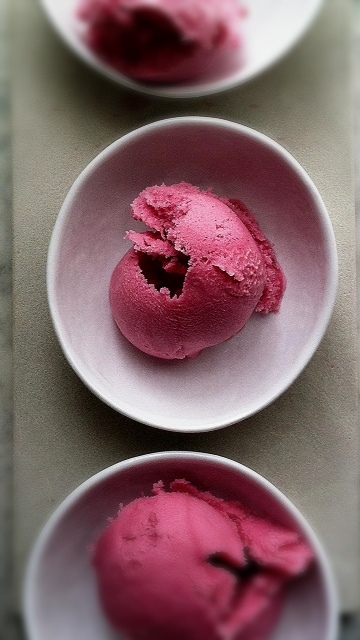 The dramatic red of the juice turned into a beautiful pink frozen dessert so light and refreshing, the perfect ending to our Sunday meal. 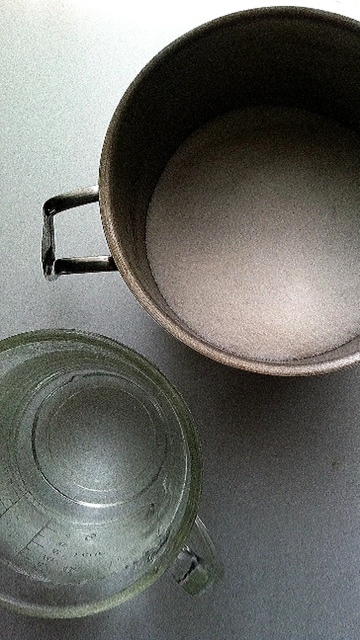 In a medium saucepan mix the sugar and water. Bring to a boil and simmer for 3 to 5 minutes, making sure the sugar is totally dissolved. You will have what is called a simple syrup. Cool to room temperature and refrigerate until cold (about a hour). In a large measuring cup with a spout, mix the cold syrup, juice and heavy cream. Pour into an ice cream maker and process according to the manuel ‘s instructions. 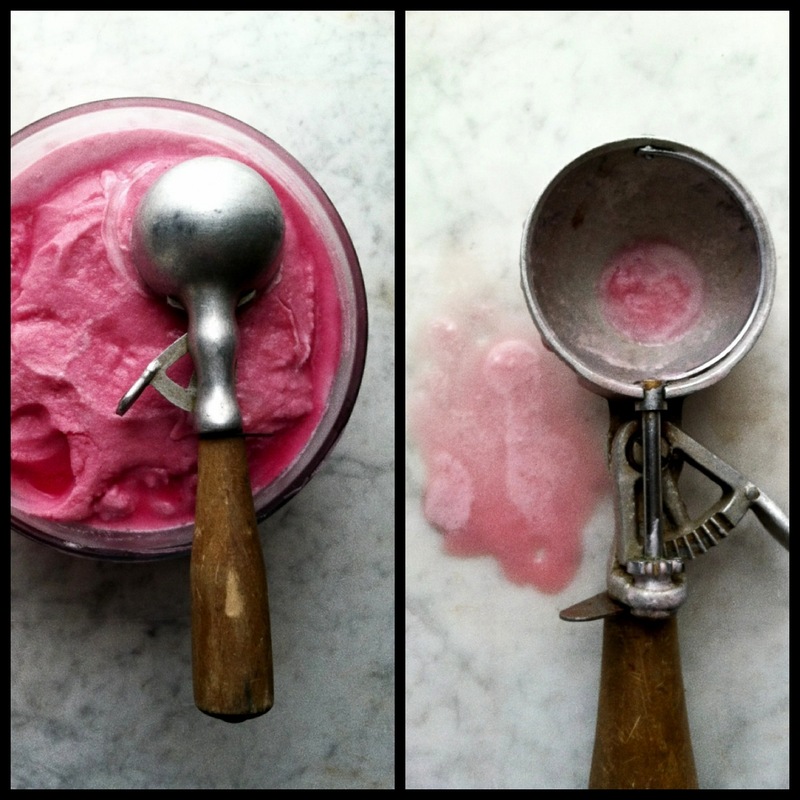 Once processed, transfer the sherbet into a freezer safe container and freeze for about 6 hours or overnight . When ready, just scoop and eat. The sherbet will keep in the freezer for about a week. NOTE: you can make the recipe without the heavy cream, you will then have a sorbet as sherbet usually has dairy and sorbet is fruit juice or puree with simple syrup. I just like that creamsicle taste and feel, thus the heavy cream.